Ghent's 2" Map Rail is an easy and affordable way to post messages, hang artwork and display awards in your school. The map rail has a 1/4" thick premium self-healing natural cork surface that still looks great after years of use. Easily mount the rail above your whiteboard or chalkboard. The stylish aluminum frame looks great in any setting. You'll receive six 8' long Ghent 2" map rails. Ghent's 2" Map Rail is an easy and affordable way to post messages, hang artwork and display awards in your school. The map rail has a 1/4" thick premium self-healing natural cork surface that still looks great after years of use. Easily mount the rail above your whiteboard or chalkboard. The stylish aluminum frame looks great in any setting. You'll receive twenty-four 8' long Ghent 2" map rails. Ghent's 2" Map Rail is an easy and affordable way to post messages, hang artwork and display awards in your school. The map rail has a 1/4" thick premium self-healing natural cork surface that still looks great after years of use. Easily mount the rail above your whiteboard or chalkboard. The stylish aluminum frame looks great in any setting. This Ghent 2" Map Rail is 8' long. Ghent's 2" Map Rail is an easy and affordable way to post messages, hang artwork and display awards in your school. The map rail has a 1/4" thick premium self-healing natural cork surface that still looks great after years of use. Easily mount the rail above your whiteboard or chalkboard. The stylish aluminum frame looks great in any setting. You'll receive six 6' long Ghent 2" map rails. Ghent's 2" Map Rail is an easy and affordable way to post messages, hang artwork and display awards in your school. The map rail has a 1/4" thick premium self-healing natural cork surface that still looks great after years of use. Easily mount the rail above your whiteboard or chalkboard. The stylish aluminum frame looks great in any setting. You'll receive twenty-four 6' long Ghent 2" map rails. Ghent's 2" Map Rail is an easy and affordable way to post messages, hang artwork and display awards in your school. The map rail has a 1/4" thick premium self-healing natural cork surface that still looks great after years of use. Easily mount the rail above your whiteboard or chalkboard. The stylish aluminum frame looks great in any setting. This Ghent 2" Map Rail is 6' long. Ghent's 2" Map Rail is an easy and affordable way to post messages, hang artwork and display awards in your school. The map rail has a 1/4" thick premium self-healing natural cork surface that still looks great after years of use. Easily mount the rail above your whiteboard or chalkboard. The stylish aluminum frame looks great in any setting. You'll receive six 4' long Ghent 2" map rails. Ghent's 2" Map Rail is an easy and affordable way to post messages, hang artwork and display awards in your school. The map rail has a 1/4" thick premium self-healing natural cork surface that still looks great after years of use. Easily mount the rail above your whiteboard or chalkboard. The stylish aluminum frame looks great in any setting. You'll receive twenty-four 4' long Ghent 2" map rails. Ghent's 2" Map Rail is an easy and affordable way to post messages, hang artwork and display awards in your school. The map rail has a 1/4" thick premium self-healing natural cork surface that still looks great after years of use. Easily mount the rail above your whiteboard or chalkboard. The stylish aluminum frame looks great in any setting. This Ghent 2" Map Rail is 4' long. Ghent's 1" Map Rail is an easy and affordable way to post messages, hang artwork and display awards in your school. The map rail has a 1/4" thick self-healing natural cork surface that still looks great after years of use. Easily mount the rail above your whiteboard or chalkboard. The stylish aluminum frame looks great in any setting. This package includes six 8' long Ghent 1" Map Rails. Ghent's 1" Map Rail is an easy and affordable way to post messages, hang artwork and display awards in your school. The map rail has a 1/4" thick self-healing natural cork surface that still looks great after years of use. Easily mount the rail above your whiteboard or chalkboard. The stylish aluminum frame looks great in any setting. This package includes 48 of the 8' long Ghent 1" Map Rails. Ghent's 1" Map Rail is an easy and affordable way to post messages, hang artwork and display awards in your school. The map rail has a 1/4" thick self-healing natural cork surface that still looks great after years of use. Easily mount the rail above your whiteboard or chalkboard. The stylish aluminum frame looks great in any setting. You'll receive one 8' long Ghent 1" Map Rail. Ghent's 1" Map Rail is an easy and affordable way to post messages, hang artwork and display awards in your school. The map rail has a 1/4" thick self-healing natural cork surface that still looks great after years of use. Easily mount the rail above your whiteboard or chalkboard. The stylish aluminum frame looks great in any setting. You'll receive six 6' long Ghent 1" Map Rails. Ghent's 1" Map Rail is an easy and affordable way to post messages, hang artwork and display awards in your school. The map rail has a 1/4" thick self-healing natural cork surface that still looks great after years of use. Easily mount the rail above your whiteboard or chalkboard. The stylish aluminum frame looks great in any setting. This package includes 48 of the 6' long Ghent 1" Map Rails. Ghent's 1" Map Rail is an easy and affordable way to post messages, hang artwork and display awards in your school. 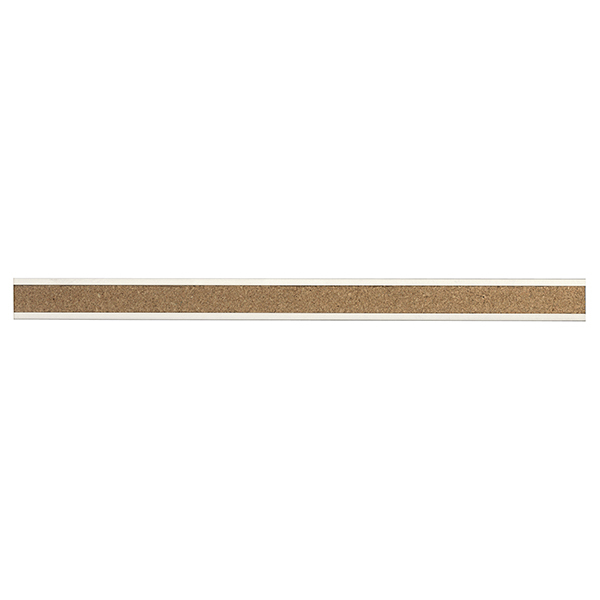 The map rail has a 1/4" thick self-healing natural cork surface that still looks great after years of use. Easily mount the rail above your whiteboard or chalkboard. The stylish aluminum frame looks great in any setting. You'll receive one 6' long Ghent 1" Map Rail. Ghent's 1" Map Rail is an easy and affordable way to post messages, hang artwork and display awards in your school. The map rail has a 1/4" thick self-healing natural cork surface that still looks great after years of use. Easily mount the rail above your whiteboard or chalkboard. The stylish aluminum frame looks great in any setting. This package includes six 4' long Ghent 1" Map Rails. Ghent's 1" Map Rail is an easy and affordable way to post messages, hang artwork and display awards in your school. The map rail has a 1/4" thick self-healing natural cork surface that still looks great after years of use. Easily mount the rail above your whiteboard or chalkboard. The stylish aluminum frame looks great in any setting. This package includes 48 of the 4' long Ghent 1" Map Rails. Ghent's 1" Map Rail is an easy and affordable way to post messages, hang artwork and display awards in your school. The map rail has a 1/4" thick self-healing natural cork surface that still looks great after years of use. Easily mount the rail above your whiteboard or chalkboard. The stylish aluminum frame looks great in any setting. This Ghent 1" Map Rail is 4' long. Increase the display area in your classroom or hallway without breaking your budget with our great selection of Ghent Map Rails. Each rail has a self-healing, natural cork surface that hides wear and tear, even after years of use. Browse our selection of 1" and 2" map rails below. At SCHOOLSin, customer satisfaction is important to us. Give us a call at (877) 839-3330 and we'll be happy to assist you with a quote or order.